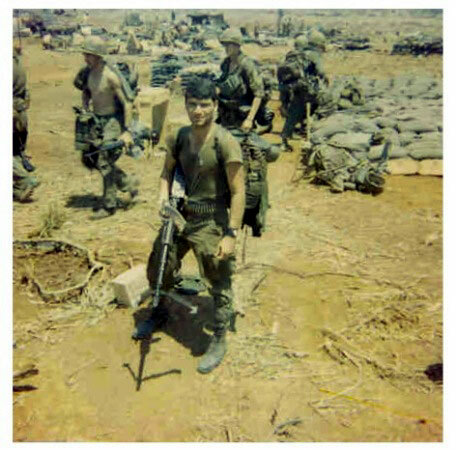 Vinture "Vinny" Sciarretti was killed in action on LZ Candy on April 1st 1970. Because of this web site I was contacted by his nephew, named in his honor. 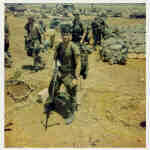 Vinny was kind enough to share photos taken during his uncles time in Vietnam. 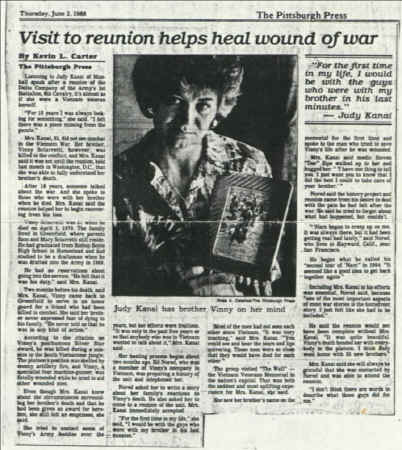 Also included is a copy of a newspaper article about his sister attending a small reunion of members of D 1/8 1st Cav that took place in the 1988. Click image to view a larger view. Visit to reunion helps heal wound of war. Listening to Judy Kanai of Munhall speak after a reunion of the Delta Company of the Army's 1st Battalion, 8th Cavalry, it's almost as if she were a Vietnam veteran herself. "For 18 years I was always looking for something" she said. "I felt there was a piece missing from the puzzle." Mrs. Kanai, 35, did not see combat in the Vietnam War. Her brother, Vinny Sciarretti, however, was killed in the conflict, and Mrs. Kanai said it was not until the reunion, held last month in Washington, D.C., that she was able to fully understand her brother's death. After 18 years, someone talked about the war. And she spoke to those who were with her brother when he died. Mrs. Kanai said the reunion helped her to begin recovering from his loss. Vinny Sciarretti was 21 when he died on April 1, 1970. The family lived in Greenfield where parents Sam and Mary Sciarretti still reside. 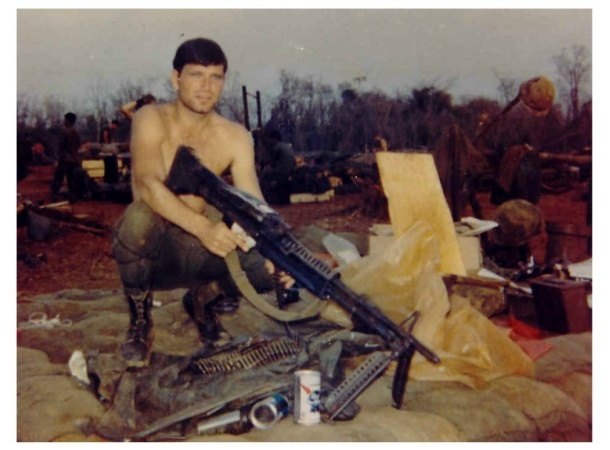 He had graduated from Bishop Boyle High School in Homestead and had studied to be a draftsman when he was drafted into the Army in 1969. He had no reservations about going into the service. "He felt that it was his duty." said Mrs. Kanai. Two months before his death, said Mrs. Kanai, Vinny came back to Greenfield to serve in an honor guard for a friend who had been killed in combat. She said her brother never expressed fear of dying to his family. "He never told us that he was in any kind of action." 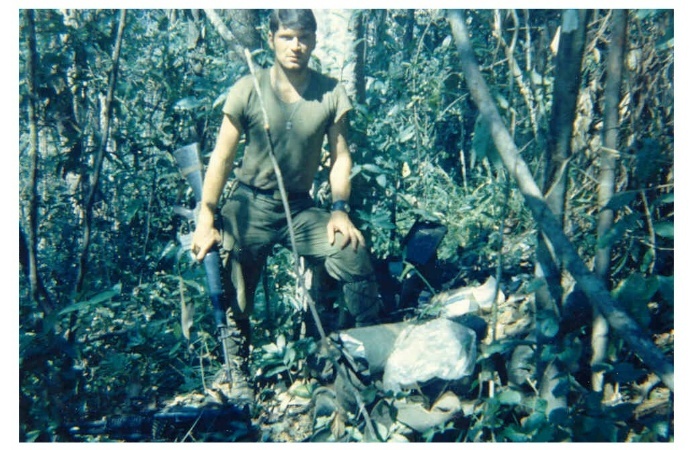 According to the citation on Vinny's posthumous Silver Star award, he was killed during a mission in the South Vietnamese jungle. 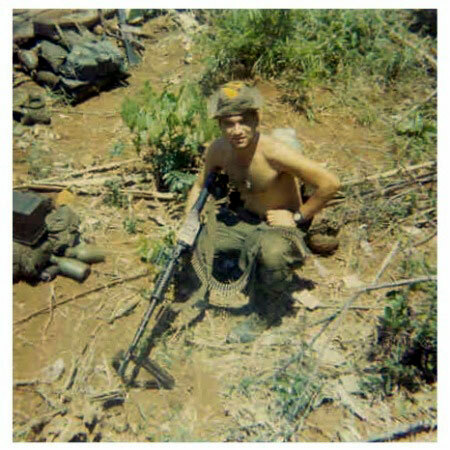 The platoon's position was shelled by enemy artillery fine, and Vinny, a specialist four machine-gunner, was fatally wounded while he tried to aid other wounded men. Even though Mrs. Kanai knew about the circumstances surrounding her brother's death and that he had been given an award for heroism, she still felt an emptiness, she said. She tried to contact some of Vinny's Army buddies over the years, but her efforts were fruitless. "It was only in the past five years or so that anybody who was in Vietnam wanted to talk about it," Mrs. Kanai said. Her healing process began about two months ago. 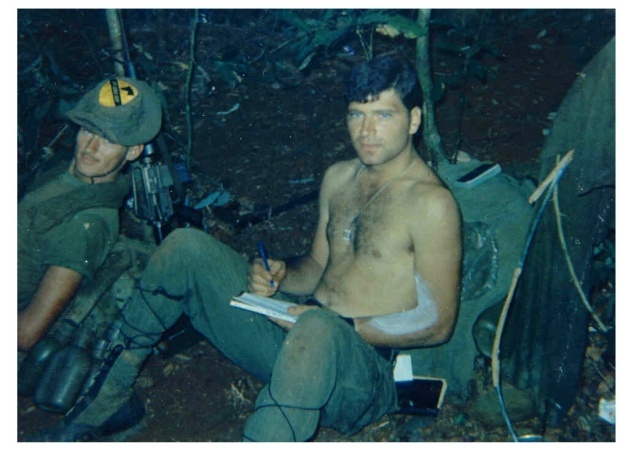 Ed Nored, who was a member of Vinny's company in Vietnam, was preparing a history of the unit and telephoned her. Nored asked her to write a story about here family's reactions to Vinny's death. He also asked her to come to a reunion of the unit. Mrs. Kanai immediately accepted. "For the first time in my life," she said, "I would be with the guys who were with my brother in his last minutes." Most of the men had not seen each other since Vietnam. "It was very touching," said Mrs. Kanai. " You could see and hear the tears and lips quivering. These men were so close that they would have died for each other." The group visited "The Wall" the Vietnam Veteran Memorial in the nation's capital. That was both the saddest and most uplifting experience for Mrs. Kanai, she said. She saw here brother's name on the memorial for the first time and spoke to the man who tried to save Vinny's life after he was wounded. Mrs. Kanai said medic Steven "Doc" Sipe walked up to her and hugged her. "'I have one thing to tell you. I just want you to know that I did the best I could to take care of your brother.'" Norad said the history project and reunion came form his desire to deal with the pain he had felt after the war. He said he tried to forget about what had happened, but couldn't. 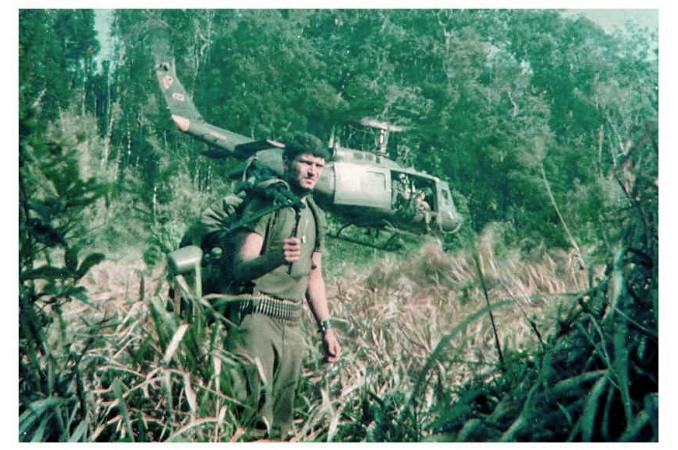 "Nam began to creep up on me. It was always there, but it had been getting real bad lately," said Norad, who lives in Hayward, Calif., near San Francisco. 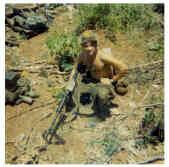 He began what he called his "second tour of Nam" in 1984. "It seemed like a good idea to get back together again." Including Mrs. Kanai in his efforts was essential, Nored said, because "one of the most important aspects of most war stories is the homefront story. I just felt like she had to be included. He said the reunion would not have been complete without Mrs. Kanai. "It was quite beautiful. Vinny's death bonded her with everybody in the platoon. I think Judy went home with 25 new brothers. Mrs. Kanai said she will always be grateful that she was contacted by Nored and was able to attend the reunion. "I don't think there are words to describe what these guys did for me." Click here to see Ed Noreds tribute to Vinny and additional photos.